The follow up to “In Re: Caylee Anthony (the shocking truth explained)” – “In Re: HaLeigh Cummings (the unspeakable spoken)” reveals two dynamics to the HaLeigh Cummings mystery that have kept the public confused for five years. Chapter 3 – The (Hush Hush) Murder will anger you; Chapter 4 – “He’s Letting People F! @k My Granddaughter” will shock your conscience. 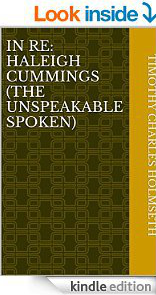 This book is for grown ups that are prepared to understand and accept the truth about what happened to HaLeigh Cummings. The author, Timothy Charles Holmseth, assisted the Minneapolis and Jacksonville FBI in 2009 as they closed in on suspects in HaLeigh’s kidnapping. In 2010, Timothy was interviewed by the FBI for several hours and asked to turn over various interviews he conducted with suspects. Timothy knows HaLeigh is alive and he knows who took her.